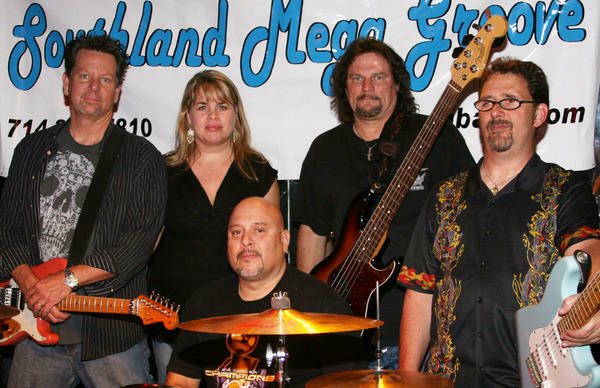 Southland Mega Groove is a Southern California 5 (to 11) – piece band with versatile vocalists that also have incredible musicianship. Kim sings everything from smooth ballads to gritty rock-n-roll, and the guys have great harmonies, each of whom also sing various rock tunes of all decades to round out a great show! All members are well seasoned and down to earth performers that will warm your heart and rock your socks off! They’re fun, professional, creative, and Mega co-operative to suit your needs. Clients rave about the band after virtually every event! Be sure to check out their reviews in various locations on the web. They’re super-tight, since the core of the band has been together nearly 20 years. Everyone will love the atmosphere created by the music that will fill the evening air!